Here is what you will find in my ‘pockets’ during my everyday escapades. These are objects that are intimate to me in that I feel naked without them. I say pockets, but we understand each other that I commute by bike to work and so my pockets include my small backpack. If you like classic styling with a minimalist touch, then take a gander below. 1 – Abus u-lock mini: Bike thieves are tenacious in Montreal, and that is why you need a rock solid lock. 2 – Opinel knife: Always be ready for the surprise baguette/cheese/dried meat in the park. 4 – Nixon Sentry Leather watch: The slogan for the brand Nixon is “Never be Late”- do I need another reason? 5 – Electric Knoxville polarized sunglasses: So you don’t miss anything that happens on those bright, bright days. 7 – Mini-moleskine: Because good ideas disappear quickly. 8 – Lezyne Multitool: Almost every important tool is on this tool to make repairs at home or on the road. 9 – Keys: They aren’t to my heart. They are normal keys. 10 – Iphone 4s: Cracked screen, of course. 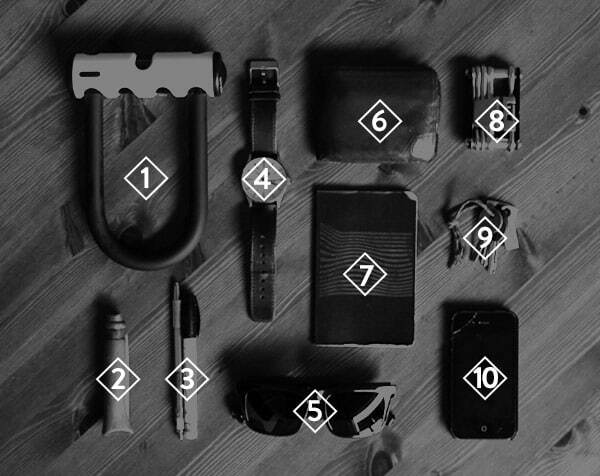 There is 1 thoughts on this article titled “Étienne’s Everyday Carry”. My EDC is Cascade Wallet, car key, and my knife. Next Next post: Shopping For Kids Online – A Match Made in Heaven!